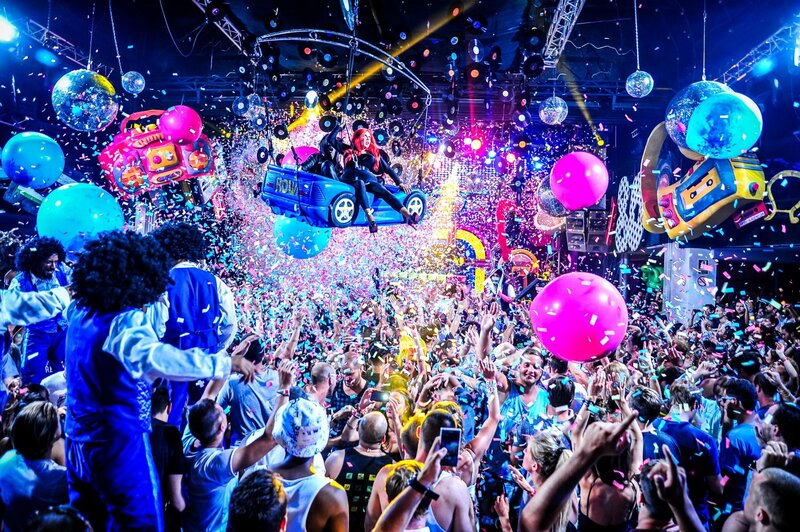 Creators Juan Arnau Jr and Cruz Arnau relate the six generations behind global phenomenon elrow. Easily the most creative party in clubland right now, elrow has been going from strength to strength since its appearance eight years ago. While the brand was born in 2010, the story behind it goes back way longer: 148 years to be precise. Even a most cursory glance at its colourful history reveals the tale and fate of the brand woven into itself. If you have never been to the party, you are missing out. Imagine your wildest fantasy world and multiply it by a thousand to fathom a fraction of what awaits at any elrow event. And you have plenty to choose from. With more than 20 immersive shows, elrow has been in over 50 cities and touched every continent. London, Shanghai, Miami, Buenos Aires, Beirut, Istanbul, Tel Aviv, Cairo, Amsterdam, Rotterdam and Brazil are all on the list. On top of that, the immersive event has residencies in Dubai, New York, Madrid Barcelona and, of course, at Amnesia on Ibiza, as well as festivals the likes of Glastonbury and Tomorrowland. At any given party, you could find yourself smack in the middle of a comic book singermonging, at Brazilian street party in the jungle, at a Spanish fair, in the far west, deep inside a psychedelic trip, in the middle of the 'rowlimpic' games, in Bollywood, the 'rowmuda' triangle, an enchanted forest and many more. A festival, a circus, a parade, a show, a fair all rolled into one - wherever it goes, elrow turns on a whole other dimension. Capturing and re-imagining world traditions, cultures and collective imagination, it takes the tales of our planetary imaginary throughout the ages and blows them up into an extreme fantasy world. Bringing the stuff of dreams to real life, the party clearly resonates with clubbers all over the world with its over-the-top hyperbolic theatricalness. Where could all this imagination come from? The creators of the phenomenon that has taken the planet by storm, Juan Arnau Jr. and Cruz Arnau, are the latest incarnation of six generations in the entertainment business. We had a chat with them about it at the inauguration of elrow House, their new headquarters in Barcelona, a few months ago. Here's how elrow came about. Once upon a time 148 years ago, elrow creators' great-great-great-great-grandfather José Satorres set the whole thing into motion opening the first social club in Fraga, Spain: the Café Josepet in 1870. Leaving the family farming traditions behind, José wore suits and ties instead of the country smocks normally seen in the farming town of Fraga. This venue became the meeting place of the town's business community. Turning into a large social club, the Café Josepet also put on shows to entertain men, primarily farmers, who were there talking business or playing cards. The business pioneer set up his own bus company to connect Fraga with the neighbouring capital town Lleida. Conveniently, the bus stop-stop was located right in front of his Café Josepet. After the death of José and his son, José's daughter-in-law Maria Vilar - so elrow creators' great-grandmother - persuades her daughter Maria Satorres and son-in-law, i.e., Maria Satorres's husband, Antonio Duran to return to Fraga to re-open and take over the Café Josepet now called the Café Victoria in 1920. The two become equal partners with their mother-in-law. The third generation behind elrow thus takes over. The bar and social club were so successful that Antonio asked Jose's daughter-in-law, his mother-in-law, Maria Vilar, to expand into the adjacent stables. At the start of the 1920s, the Theatre Victoria brought on another dimension to the family business. Putting on all kinds of revolutionary and risqué variety shows, the young Antonio spent his time going back and forth between the Café, the social club and the recently opened Theatre. To avoid rivalry with another theatre next door, Antonio turned it into the ever-famous Cine Victoria, playing American silent movies. Business was so good that an open-air terrace had to be added under the direction of Antonio Duran, to meet demand during the summer. Already by this point, they had opened the first open-air cinema, turning the place into the first full entertainment centre in Spain. Effectively, this brought the modern way of life to the Bajo Cinca of Aragón - quite the accomplishment, and that's still three generations away from current times elrow. In 1924 we have the first Juan come into the picture, Juan Arnau Cabases - let's call him Juan I - with his wife Francisca Ibarz Quer. After 20 years doing business with flour mills and oil presses, Juan I, impressed by the Cine Victoria's success, built his own rival cinema: the Cine Florida in 1925 just down the street. In a classic Romeo and Juliet story, Maria and Antonio's only daughter Pilarín and the Arnau's firstborn son Juan Arnau Ibarz - or for our purposes Juan II - fell in love. Santiago Satorres, Pilar's uncle, took over as manager to avoid competition. With ever-growing ambition, Juan (I) Arnau Cabases wanted to expand further and take on dance and music entertainment. To this end, he created the Garden Terrace Florida in 1950 which was accessed directly from the Florida Cinema, and later the Saloon Florida. The Saloon Florida brought the best and most varied orchestras to the area, from as far as Barcelona, Madrid and even Las Vegas. In 1953, Pilarín and Juan(ito) (II) Arnau Ibarz married, bonding the fourth generation of the elrow-to-be family. The empire behind elrow begins, as all the businesses were brought under the family. Honeymooning in Paris, the two experienced the spectacular shows at the Folie Bergère and Moulin Rouge, which sparked the desire to bring these shows to Fraga. As the 1960s progressed, the first nightclubs came into being: discotheques were born, replacing live orchestras with DJs and records. Together Juanito Arnau II, his brother José and their wives turned the Saloon Florida into the Florida Club. Under the direction of top architect Javier Regás, the Florida Discotheque Fraga was completed in 1973. As competition intensified in the 1980s, with the appearance of the BigBen and Wonder, the Arnaus closed for a while. Seeking out Javier Regás, now a hippie in Goa, once again, they convinced him to design the Club Florida 135 in 1985, to resemble the world of Blade Runner. Later re-named Florida 135 Tendenze Club, it specialised in self-indulgent extravagance and universal electronic music from the Valencia Bakalao Route. The nightclub brought together musical trends of the previous three decades, including disco, the Madrid pop and rock scene, singers and soloists of the post-dictatorship period, the great dance hits of all time, house, acid-house, makina, bacalao and finally the most underground and universal electronic music. In essence, it was the first electronic music nightclub. In 1993, Juan II Arnau Ibarz, Pilarin and their son Juan III Arnau Duran, heralding the fifth generation of the story, got permission to go dance in the Monegros, the estate that Josepet lost and won back playing cards. The Monegros Party came to life, later renamed the Groove Parade, the Monegros Festival and finally the Monegros Desert Festival. From 200 friends in 1993, it surpassed 40,000 in 2014. Juan(ito) III (Arnau Duran) married Maria Cruz Lasierra. Their children are Juan Arnau Jr. (IV) Lasierra and Cruz Arnau, the current owners and managers of the elrow brand. Juan III went on to opening the family's first club in Barcelona in 2001 and called it Row, after a family friend's surname. The name actually came from a great friend of the family, Ricart Robles, who together with Sergi Caballero and Enric Les Palau were and are still owners of Barcelona Festival Sonar. Seven years later in 2008, Juan (III) was invited to view an old farmhouse by the airport that used to be a restaurant of an ex-Barcelona player but, after a stint as a rock and roll concert venue Vertigo, had become one of the city's favourite after-hour clubs: the Fricht. He took it over and called it Row14, after the 14 km from Barcelona centre. After a massive renovation that left him almost bankrupt and council inspections almost preventing its opening, it held a massive opening in May 2008, featuring Laurent Garnier. In 2010, Row14 was doing morning sessions run by his kids Juan IV and Cruz and in June of that year, elrow was born. Bordering on legality, Sunday sessions went on until the authorities shut them down in Nov 2012. In the meantime, Juan (IV) and Cruz started doing seasons on Ibiza. As teenagers, the two partied at Circoloco, Pikes, Bora Bora, La Troya and at the after-hours at the late Space. Cruz remembers fondly being dressed up by her mother to look older and walking around the streets of the Ibiza Town port, seeing the parades of the various superclubs. In the summer of 2011, they did a one-off at The Zoo Project at Benimussa Park on Ibiza. The following summer in 2012, they did a season at the Vista Club and then another in 2013. Meanwhile, the original elrow sessions continued at Row14. Juan II Arnau Ibaz, the founder of Florida135 - the one who arrived in Fraga in the mid-1920s and had come to be known as 'techno grandfather' - passed away in September 2012. Carl Cox paid tribute to him that morning at Row 14. Juan III Arnau Duran still acts as an advisor to his descendants. After two seasons at the Vista Club, elrow took over the late Space for three massive seasons. It then went on to selling out Amnesia almost every week in 2017. With a background like this one, the result is not a surprise. Six generations in the making, elrow is like nothing else you'll ever experience. If you haven't been, make sure you go. This is one clubbing experience you need to have at least once in your life. Following elrow's unveiling of the 2018 line-ups for Ibiza, we can bank in another smashing season for the unique brand.